Kages Flames of War: Does the Ferdi Die or Survive? Its Up To You! Does the Ferdi Die or Survive? Its Up To You! Well, I thought I was getting pretty good at airbrushing. But this is by far the hardest thing I've tried. I wanted to try something like this picture with the thinner camo lines. 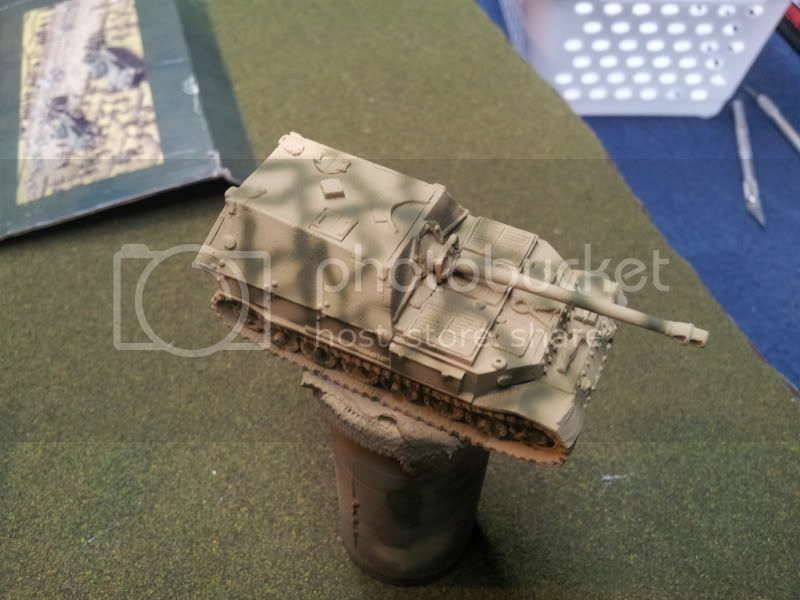 I even used a 2mm airbrush. It was so hard, and in the end my lines turned out way thicker then I expected. So, I thought I would try something different and leave the choice up to my millions and millions of fans. For those who don't paint, this is far from finished. It has no detail, or wash, or highlighting. I know I can do a lot better. On the other hand its starting to grow on me. With some detailing and highlights it might not be bad. Especially at 15mm the thicker lines might be OK. But there is that one glaring spot on the hull that splattered. can you see it? Let me know what you think. Does this Ferdi die or Survive? Seriously man, it doesn't look bad, sure the lines are a little thicker, but still looks good. It's hard to get those fine lines at 15mm, and when it's achieved it often looks too busy. I like it, I say keep it. Yeah scale has a interesting effect on almost everything on these 15mm tanks. It affects colour with a recommendation I saw once to lighten the colours when decreasing the size of the tank. Sometimes if you try and recreate some of the more finer camo patterns it just gets lost at this scale. I think ya Ferdi looks good. 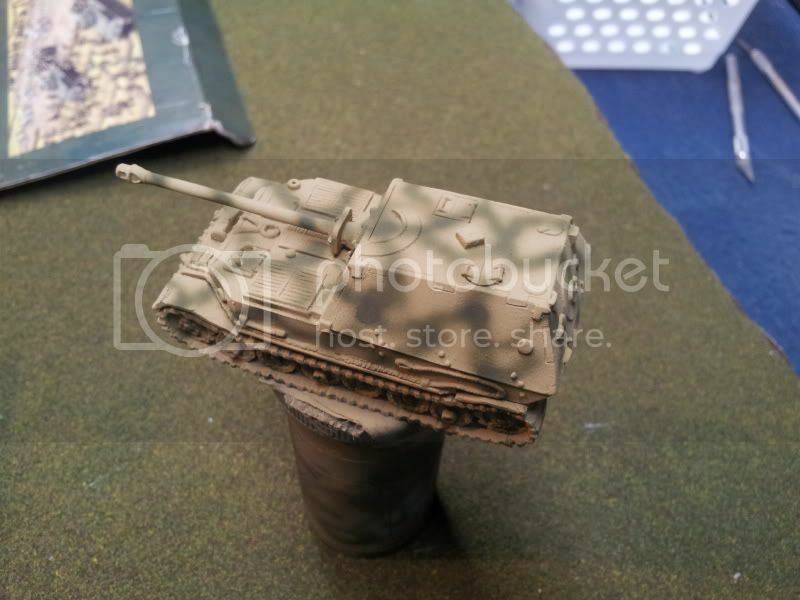 Doing camo "to scale" is well beyond my capabilities in 15mm, so I think going for a representation of the scheme is better than attempting to mimic it perfectly. I'm with Chevalier, you've just got to represent that camo on the scale and you've done a very good job of that. I tried that pattern on a Ferdi several years ago and just ended up hand painting it in as my airbrush simply won't get that much detail. Did you take away the nozzle on the air brush, so the needle is exposed? Doing that + turning the pressure down will let you make very fine lines. Try it out on a piece of paper. AH...Makke...that's what I forgot to do. I totally new that. I was wondering why my lines were so thick. If I remember what I've read, you don't take the nozzle off. You take nozzle cap and/or needle cap off to expose the nozzle. Then spray really close. seems like the consensus is to keep it. I may have to buy another Ferdi to try it.